Regardless of whether lightning is positive or negative, thunder is produced the same way. 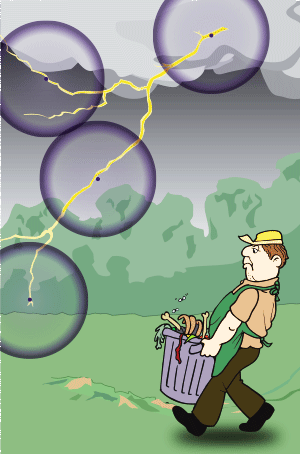 Thunder is the acoustic shock wave resulting from the extreme heat generated by a lightning flash. Lightning can be as hot as 54,000°F (30,000°C), a temperature that is five times hotter than the surface of the sun! When lightning occurs, it heats the air surrounding its channel to that same incredible temperature in a fraction of a second. 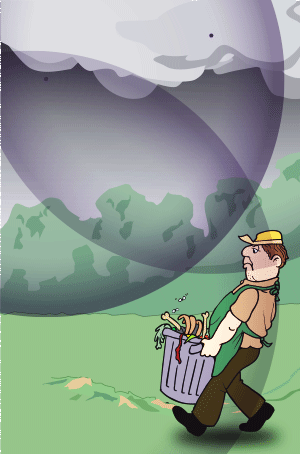 Like all gases, when air molecules are heated, they expand. The faster they are heated, the faster their rate of expansion. But when air is heated to 54,000°F (30,000°C) in a fraction of a second, a phenomenon known as "explosive expansion" occurs. This is where air expands so rapidly that it compresses the air in front of it, forming a shock wave similar to a sonic boom. Exploding fireworks produce a similar result. When lightning strikes, a shock wave is generated at each point along the path of the lightning bolt. (The above illustrations show only four points.) When the shock wave is first created there is a sharp boundary associated with it. The initial sound reaches the ear with a loud bang, crack or snap. As shock waves propagate away from the path of the lightning bolt, they are distorted becoming stretched and elongated. 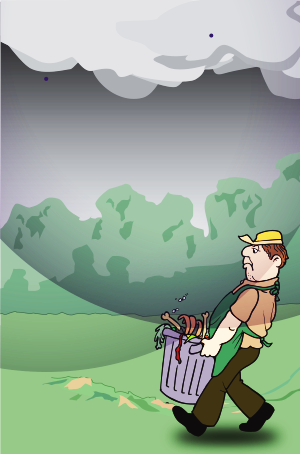 The sound is more muted. Then other shock waves from more distance locations arrive to the listener. Shock waves emanating along the lightning bolt's path, arriving to the listener's ear at the same time, enhance the intensity of the sound. At large distances from the center, the shock wave (thunder) can be many miles across. The shock wave is greatly elongated. To the listener, it is the combination of the millions of shock waves that gives thunder the continuous booming/rumbling sound we hear. How sound waves travel through cool and warm air. In addition, the temperature of the atmosphere affects the thunder sound you hear as well as how far away you can hear it. 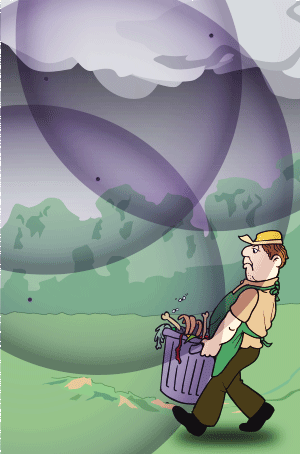 Sound waves move faster in warm air than they do in cool air. Typically, the air temperature decreases with height. When this occurs, thunder will normally have an audible range up to 10 miles (16 km). However, when the air temperature increases with height, called an inversion, sound waves are refracted (bent back toward the earth) as they move due to their faster motion in the warmer air. Normally, only the direct sound of thunder is heard. 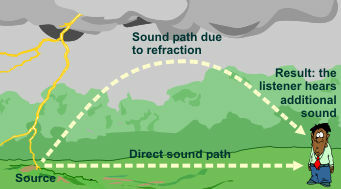 But refraction can add some additional sound, effectively amplifying the thunder and making it sound louder. How warm and cool air affect the sound of thunder. 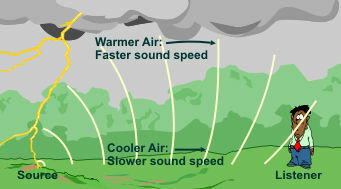 This is more common in the winter as thunderstorms develop in the warm air above a cooler surface air mass. If the lightning in these "elevated thunderstorms" remains above the inversion, then most of the thunder sound also remains above the inversion. However, many of the sound waves from cloud-to-ground strikes remain below the inversion giving thunder a much louder impact.